Valérie Guérinin took over domaine Les Mille Vignes in 2000, created by her father Jacques Guérinin, inn 1979, in the southern Languedoc it quickly became one of the leading stars in the South of France. With 13 plots carefully tended to and spread over 11 hectares and three appellations (Fitou, Rivesaltes and Muscat de Rivesaltes) Valérie creates distinctive wines, letting the terroir speak with old and sometimes forgotten varieties. Praised by chefs around the world, domaine Les Mille Vignes has become an ambassador for French taste and savoir-faire. And it’s no surprise that wines are found at Michel Sarran, Alain Passard, the Élysée and around the world: Hong-Kong, Tokyo, Pierre Gagnaire; London; Amsterdam; and in the U.S where the influential importer Kermit Lynch distributes the wines. Today, Les Mille Vignes has two new projects: a new chai and a new wine made exclusively for 7 Michelin starred chefs around the world. 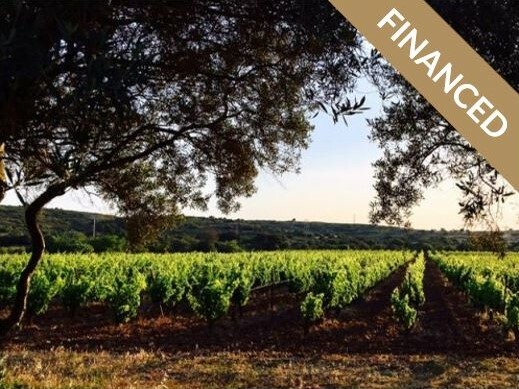 You lend Domaine Les Mille Vignes between 130 and 750€ to finance their project. The domaine will then reimburse you in wine delivered straight to your door over one or several years depending on the plan you choose. Drought was a significant problem in 2017, but Valérie was blown away by one of her cuvée, the Lledoner Pelut, this old variety was all but forgotten in the south of France, and Valérie wants to trumpet its wonderful properties. . The minuscule 17 HL cuvée is undoubtedly her best wine in 2017. She wants to share this exceptional wine with you as part of a crowdfunding project. You receive this wine only once in 2019 when its ready. Or, you can receive this wine every year for three years from 2019. As a WineFunder you benefit from a special price on the wines and the cost of shipping is included. The wine is typically sold at 55€ the bottle, so you save 5€ a bottle. If you want to get involved in the project and receive existing wines from Domaine les Mille Vignes, you can click here and choose one of the other plans. click here to see the other plans. The funds raised will be used to buy 19 small stainless-steel vats perfectly adapted to the new chai.